A New Mac Tip Every Day: Quickly rating photos! Rating photos in your iPhoto library is really useful because you can then specify that you only want to look at "four stars or more" or maybe "three stars or more" pictures. 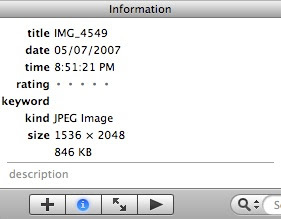 Rating the photos one by one in the "Information" box that is in the lower left corner of iPhoto is really long though. The quick way that I discovered is to double-click on the photo (it brings you to a preview mode, not the edit mode) and press anything from "Command - 0" to "Command - 5" depending on the rating you want. If you click on the "i" in the lower left corner before, you will get the information box and you'll then see the rating being added live. There's an easier way if you don't what to use keyboard commands and what to do alot of your photos. Just start a slideshow then move your mouse and the onscreen controls pop up. From there, you can rate each photo that comes up. I went through most of my photos that way!! Wow, Thats the way to do it with the slide show! Whew, what an amazing tip, I shall pass it right along to my friends.